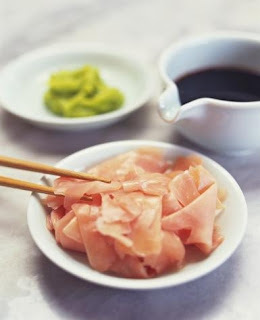 I like to keep sushi making simple, but there are many fillings which can be used, such as omeltte egg roll, salmon, avocao, toasted sesame seeds etc..
Bring the water to the boil, add salt and rice and reduce to a simmer for 15 minutes. Microwave 2 T white vinegar and 1 dessertspoon of sugar until dissolved. 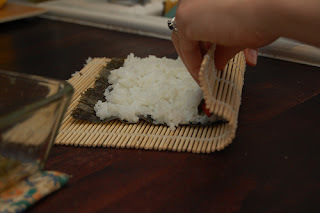 When the rice is cooked, add the vinegar mixture and stir through until its all absorbed. 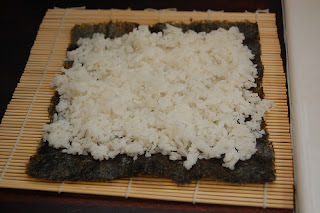 Place your “fillers” (tuna, cucumber & radish) on the edge of the nori sheet closest to you. 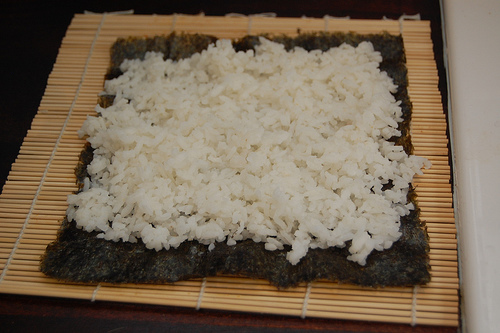 Make sure the fillers are in front of the rice. 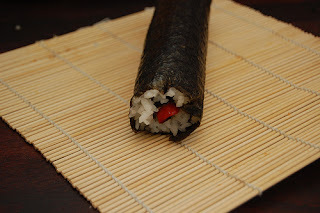 Using you rolling mat, nudge the roll forward. Squeeze the roll tight to ensure the edge is sealed. Remove your roll to a cutting board, and cut into 6-8 pieces.